The International Energy Agency (IEA) published a report with assessments for greenhouse gases emissions over the previous 3 years. The report shows that, despite all efforts to reduce GHG emissions, the emissions beat the records. The year 2010 has recorded the strongest growth, by 1.6 Gt (the previous record stood at 1.2 Gt). The energy intensity rose in 2010 for the first time since 1990. The year 2011 has set a new record for CO2 emissions: the amount of climate pollution has increased by 1 Gt and made 31.6 Gt. On the other hand, efforts to reduce emissions started to bring results: the growth rate was only at the fourth place in the history of observations, whereas the lack of effort could have brought a huge increase in greenhouse gases. Member countries of the Organization for Economic Cooperation and Development (OECD) have reduced their emissions by 0.6 % as compared to 2010, while indicators of other countries increased by 1.6 %. China demonstrates appreciable difference between the possible and actual emissions growth (0.72 Gt). The ratio of CO2 emissions to gross domestic product in China fell by 15 % in 2005-2011. Without this, China's emissions in 2011 would be by 1.5 Gt higher. In such a short period, the country has done much to improve energy efficiency and introduce alternative energy. CO2 emissions in the U.S. fell by 1.7 %, mainly due to transition of coal-fired plants to natural gas. European emissions fell by 1.9 % due to slow economic growth and warm winter. Emissions in Japan rose by 2.4 % due to the fact that fossil fuels came to replace nuclear power after the accident at the Fukushima nuclear power plant. India’s emissions rose by 140 Mt, or 8.7 %, moving it ahead of Russia to become the fourth largest emitter behind China, the United States, and the European Union. Despite these increases, per-capita CO2 emissions in China and India still remain just 63 % and 15 % of the OECD average respectively. The 450 Scenario of the IEA’s World Energy Outlook 2011 requires CO2 emissions to peak at 32.6 Gt no later than 2017, i. e., just 1.0 Gt above 2011 levels. Additionally, according to experts, there is an urgent need to deploy an infrastructure that will provide emission reductions after reaching the peak. 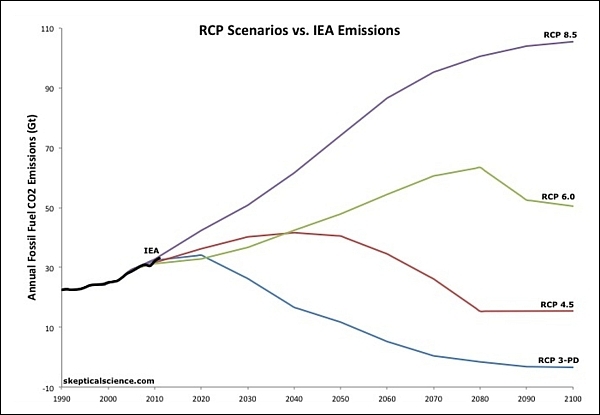 In order to achieve the necessary emission reductions, the IEA Scenario provides introduction of a carbon tax in developed countries in the range of $ 20-45 per ton in 2020. By 2035, the tax shall reach $ 95-120, and for all countries. It is clear that a binding international agreement is necessary to achieve these goals. As for Russia, emissions are going down. In April 2011, Russia officially presented its next inventory, which provides information on national emissions and sinks of greenhouse gases in 2009. According to the report, emissions of greenhouse gases in Russia in 2009, excluding land use, land-use change and forestry (LULUCF) decreased by 3.2%, down to 2.16 billion tons of CO2-equivalent. However, these achievements cannot be considered as a result of climate policy. Alexander Nakhutin, the deputy director of the Institute of Global Climate and Ecology of the Russian Academy of Sciences, who coordinated preparation of the report, has confirmed in an interview with RIA Novosti that Russia's emissions have decreased mainly due to the economic downturn. Representatives of Russian non-governmental organizations write in their Statement: "Russia's voluntary commitments to reduce greenhouse gas emissions shall be increased up to 40 % (emissions in 2020 at 60 % of the 1990 level, excluding stock of quotas from the first period of the Kyoto Protocol). The NGOs urge state officials to take climate responsibility and join an international agreement reinforced by actual commitments.